If you're happy with your existing landline service but want to add more lines to an existing Orchid PBX unit to save money on your call costs, the hybrid PBX solution gives you the best of both worlds. It's also ideal if you want a separate line for business-only calls. Using one or more of our Internet adaptors provided free of charge, you can add IP lines to your PBX phone system, use your existing phones and share the line(s) throughout the office. Unlike the full IP/cloud solution, you pay per line rather than per user. Contact us on 01572 717888 to learn more, or e-mail sales@orchid-telecom.com. What is the difference between a Hybrid PBX and Cloud PBX system? With the Hybrid PBX package, you can add IP lines to an existing Orchid PBX system. In this instance, the client only pays per line and these are each shared between all the users and extensions. With the Cloud IP package, you would pay per user/extension, making it a more costly option. If you had six employees all requiring a PBX system, you would also need six IP lines with Cloud IP. Many businesses therefore opt for the Hybrid PBX package based on this notable cost-saving benefit. As an example of how much this could reduce your costs, if you are sharing 3 lines between 6 people (instead of paying for 6 separate lines), you would get a saving of over £15.00 per month or £180.00 per year. What is the difference between a single Hybrid solution and a Hybrid PBX system? A single hybrid solution is ideal for a one-man operation working from a home office that needs a separate line and number but does not want to fork out £130.00 for a new BT line. It uses his existing broadband line and normal telephones. This can save the client call costs and give them a new number for business, separating your work and personal life. With a hybrid solution connected to a PBX, new VoIP lines are connected to an Orchid Telecom PBX system. It is ideal for remote areas where broadband services are not brilliant and allows you to get the best of both worlds. 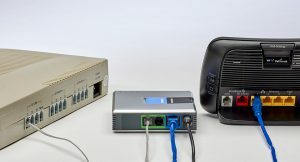 In the ideal set up, it would create interconnectivity between analogue (traditional) lines and the new VoIP lines. All extensions would call out on the low-cost IP lines and the analogue line/s that have the published number on it would be reserved solely for incoming calls. This saves money and removes the risk of any down time, which can be prohibitive to businesses. Add a Cloud Phone to your existing broadband supply and get a service that includes the ability to divert calls to mobiles, auto-attendant, voicemail to e-mail, call recordings and much more. Package includes IP phone. * Line rental and unlimited calls to UK landlines and mobiles. * All prices are per month, per user.